Baltasar Garzón, Spanish Judge that jailed Pinochet offers hope to Mapuche. Home /News/Baltasar Garzón, Spanish Judge that jailed Pinochet offers hope to Mapuche. 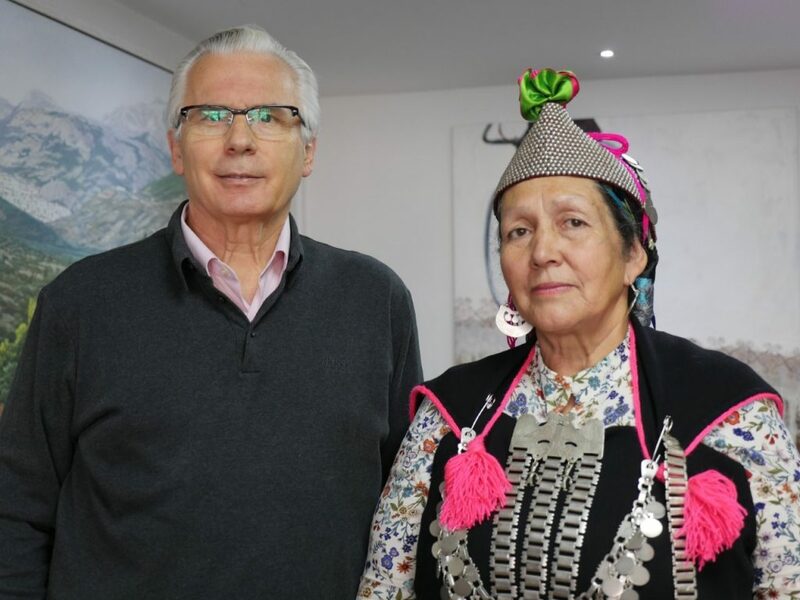 Baltasar Garzón, dubbed ‘The Spanish Pursuer,’ who famously issued the warrant that led to the arrest and detainment of General Pinochet in London, has met with Lonko (community leader) Juana Calfunao in the Netherlands to discuss the human rights situation of the indigenous peoples of Chile and Argentina known as the Mapuche , one of the largest native peoples groups in the Americas. Juana Calfunao visited the International Criminal Court offices at The Hague on 11th April 2019 with her lawyer Zulma Villa Vilchez. They presented a series of documents accusing the Chilean and Argentine states of the systematic abuse of the human rights of the Mapuche. Both governments have engaged in repressive actions. Earlier this year in Chile, Mapuche rights activist Camilo Catrillanca (24) was shot in the back while riding in a tractor by a member of a special-forces paramilitary police unit, part of Chile’s Carabinero police force, nicknamed the ‘Commando Jungla’ (Jungle Commandos) following their training by the Colombian army. In Argentina, Mapuche activist Santiago Maldonado was reported missing. His decomposed body was discovered 72 days later. His family maintains it was a forced disappearance. To date, nobody has been held to account for either case. At present there are around twenty Mapuche prisoners serving time in Chilean jails accused of terrorism offences under a law passed during the Pinochet dictatorship. The terrorism crimes most of these Mapuche were accused of involved direct-action protests against the forestry plantations and infrastructure that now dominate their ancestral lands, not coordinated attacks designed to maim and kill civilian populations. The Mapuche, along with their Chilean and international supporters, view their jailed members as political prisoners. Lonko Juana Calfunao is the founder of the Chilean NGO Ethical Commission Against Torture. In November 2006, she was given a 150 day prison sentence by the Chilean courts for protesting against the illegal construction of a private road through ancestral lands. She spent four and a half years in jail. Other members of her family have also been persecuted or imprisoned. Her daughter, Relmutray Cadín, was sent to Switzerland at the age of 9 where she applied for political asylum. There will be an opportunity to meet the delegation on the 12th of April at 18:00 hrs. at Casa Migrante, Van Ostradestraat 268, 1073 TV, Amsterdam. Lonko Juana Calfunao and her lawyer Zulma Villa Vilchez will be hosting a talk. Mapuche groups to present at The Hague against Argentina & Chile for acts of genocide. Mapuche Genocide Needs International Attention – and ICC Action!